I'm working on the second Fireside Sock from my new pattern Fire - Elements Sock Collection II. 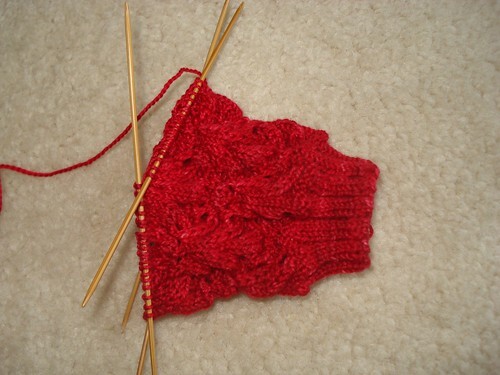 Of course, once I finish it, I'll have to knit the second Lava Flow sock from the same collection. Everytime I write a sock pattern, I tell myself to do the full pair for each design before publishing the pattern, that way I can start on the next pattern immediately, but since I have the pattern written after I've knit the first sock, I don't see any reason to wait. So here I am again, finishing pairs for a previous pattern, when the yarn for the Water socks is taunting me, waiting for me to get started on those designs. Thankfully, both of these designs worked up pretty quickly on the first socks, so the second socks shouldn't take TOO long. I don't know if I would be able to go back and do it later. I would have to finish the second one right away or else I would get distracted by pretty other knits! It is a lovely sock btw.